Dentigerous cysts, the most commonly occurring developmental cysts of the jaw, develop in association with impacted teeth. Most dentigerous cysts are solitary. Multiple dentigerous cysts are rare and generally occur in association with a developmental syndrome or systemic disease, such as mucopolysaccharidosis and cleidocranial dysplasia. However, in the absence of a syndrome, occurrence of multiple dentigerous cysts is rare. Development of multiple dentigerous cysts on first molars extremely rare. The purpose of this paper was to report on a nonsyndromic, 8-year-old boy who presented multiple dentigerous cysts on first molars. 함치성 낭은 미맹출 치의 치경부에 부착되어 치관을 둘러 싸는 병소로 내·외측 퇴축 치아상피의 층 사이나 내측 퇴축 치아상피와 미맹출치의 치관사이에 액체가 축적되어 발생하 는 치성 낭이다. 급성 염증이 동반되지 않는 한 대부분에서 증상이 없으나, 진행되어 병소의 크기가 증가됨에 따라 치조 골의 팽창 및 골의 파괴, 주위 치아의 변위와 치근 흡수 그리 고 영구치의 맹출 장애와 같은 문제점이 나타날 수 있다1-2). 치근단 낭 다음으로 가장 흔한 치성 낭으로 10대와 20대에 호발하며, 매복되거나 미맹출된 영구치 치관과 연관되어 나타 나고, 특히 하악 제3대구치에서 가장 많이 발생하며 상악 견 치, 상악 제3대구치 순으로 호발한다. 대칭적이고 경계가 잘 지워진 단방성의 방사선 투과상을 띠며, follicle 공간이 5mm 이상이라면 함치성 낭을 의심해볼 수 있다3). 함치성 낭은 흔한 발육성 낭이지만 대부분의 경우 단독으로 발생한다. 쇄골두개 형성이상, Maroteaux—Lamy syndrome, 기저세포 모반 증후군이라고도 불리우는 Gorlin—Goltz syndrome와 같은 증후군이 있는 환자에서 양측성 또는 다발 성으로 발생하기도 하나 이러한 증후군이 없이 다발성 함치성 낭을 보이는 경우는 드물게 나타난다4-5). 본 증례는 증후군이나 전신질환이 없는 10대 이전의 환자 에서 제1대구치에 발생한 다발성 함치성 낭의 발생 및 치료 증례를 보고하고자 한다. 만 8세 남자 환자로 #16, 36, 46의 맹출 지연을 주소로 원광 대학교 소아치과로 내원하였다. 임상검사에서 완전히 맹출한 #26에 비해 #16, 36, 46의 매복이 관찰되었으며, 구강 내 특이 할만한 임상소견은 관찰되지 않았다. 파노라마 방사선 영상에 서 #16, 36, 46의 치관을 포함하는 비교적 경계가 분명한 단방 성의 방사선투과상이 관찰되었고, #36, 46의 경우 다소 원심 으로 경사되어 관찰되었다(Fig. 1). 병소의 정확한 크기 및 위치의 3차원적 분석을 위해 CBCT (Cone beam computed tomography)를 촬영하였다. CBCT 촬 영 결과 하악 양측 병소에 의해 피질골의 비박이 관찰되었으며, #16번은 원심 협측, #36, 46은 원심 설측으로 경사되어 있었고 치관주위로 4-5mm정도의 단방성의 방사선 투과상 병소가 둘 러싸고 있었다(Fig. 2). 전신마취 하에 낭 적출 및 조직검사, 그리고 치아의 맹출을 위해 Forced eruption을 계획하였다. 환자의 구외, 구내 임상적 검사 및 전신마취 하 수술을 위한 chest 방사선사진, 혈액검사 등에서 전신적 이상 징후 발견하 지 못하였다. 전신마취 하에 제1대구치의 치관을 둘러싼 병소 의 적출을 시행하였고, 적출된 병소의 조직병리학적 검사 결 과 편평상피로 이장된 함치성낭으로 진단되었다. 매복깊이가 얕고, 경사가 심하지 않은 #16은 자연맹출하기 를 기다리고, 치근단이 거의 형성되어 있으며 원심경사된 #36, 46의 경우 치축개선을 위해 Modified Nance holding arch를 이용하여 교정적 견인을 시행하였다(Fig. 3). 2개월 뒤 #16, 36, 46의 일부의 교두가 구강내로 맹출이 확 인되었고, 장치의 잦은 변형 및 장력의 약화로 Reopen 후 button의 재부착 혹은 anchor를 전방으로 변경을 고려해볼 수 있었으나 변경 없이 자연적 맹출을 기다려 보았고(Fig. 4), 7 달 뒤 파노라마 사진에서 제1대구치 맹출 및 치축개선이 관찰 되었다(Fig. 5). 수술 후 10개월, 그리고 자발적 맹출을 지켜본 7개월 후 좌측은 치관 2/3 가량 맹출하였고, 양호한 교합이 확인되었으 나, 우측에서는 교차교합양상이 관찰되어 교차교합해소를 위 한 변형된 장치를 장착하였고, 술 후 1년 제1대구치의 양호한 교합상태를 얻었으며, 낭의 재발 및 전신적 이상증후 관찰되 지 않았다(Fig. 6). 함치성 낭은 흔한 발육성 낭이지만 양측성 또는 다발성 함 치성 낭은 극히 드물다. 양측성 또는 다발성 함치성 낭은 일반 적으로 다음의 증후군들과 연관된다. 점액다당류증 VI형으로 도 알려진 Maroteaux-Lamy syndrome은 glycosaminoglycan 분해에 필요한 특정 lysosomal enzyme의 유전적 결함으로부 터 기원한 질환이다. 치과적 특징은 미맹출 치열, 다발성 함치 성 낭, 부정교합, 과두의 결함, 치은 증식 등이 있으며, 전신적 으로는 각막혼탁, 관절구축, 안면기형, 판막형 심질환 등을 나 타낸다6) 쇄골두개 형성이상(cleidocranial dysplasia)는 상염생 체 우성 유전질환으로 쇄골의 부분적 또는 전체적 소실, 작은 키, 전두부와 두정부의 융기, 상악 열성장, 유치열의 만기 잔존, 영구치열의 맹출 지연, 미맹출 과잉치 등의 특징을 보인다4). Gardner’s syndrome은 다수의 과잉치과 다발성 함치성 낭과 관련된 질환으로, 위장 용종, 표피 낭종, 골종을 특징으로 하며 7), 기저세포모반증후군(Basal cell nevus syndrome)은 우성 유 전 질환으로 피부, 눈, 골격계, 내분비계 이상을 초래하는 질환 이며, 상·하악에 다발성 함치성 낭이 나타날 수 있다8). De Biase 등9)은 신장 이식 후 cyclosporine과 연관된 양측성 함치 성 낭을 보고하기도 하였는데 이러한 전신질환 또는 증후군을 보이지 않는 다발성 함치성 낭을 보이는 경우는 매우 드물다. 함치성 낭은 주로 하악 제3대구치에서 가장 호발하며, 상악 견치, 상악 제3대구치, 하악 제2소구치의 순으로 호발하고, 드물 게 미맹출 유치나 과잉치, 치아종 등과 연관이 되기도 한다10). 본 증례의 경우 함치성 낭과 연관된 치아인 제1대구치는 영구 치열의 저작기능에 주된 역할을 하며, 혼합치열기 이후의 수 직적 교합관계 형성 및 악골의 성장발육에 중요한 역할을 하 는 치아이다. Grover 등11)에 의하면 상악 제1대구치의 매복빈 도는 0.02%, 하악 제1대구치의 빈도는 0.01% 이하로 나타나 며, 매복의 원인으로는 불충분한 공간, 낭성변화, 치아종 같은 물리적 방해물 등으로 매복이 일어나는데 이 중 함치성 낭으 로 인한 제1대구치의 매복비율은 매우 낮게 나타난다. 따라서 제1대구치의 함치성 낭은 아주 드물게 나타나지만 발생하게 되면 하안면 고경의 감소, 치조골의 불완전한 발달, 대합치 정출과 같은 부정교합 등이 생길 수 있으므로 적절한 시기의 적절한 개입이 중요하다고 사료된다. 전신적 증후군이 관련되지 않는 한 다발성 함치성낭의 치 료는 일반적인 함치성 낭의 치료와 특별한 차이를 보이지 않 는다. 함치성 낭을 치료하는 방법을 결정하기 위해서는 낭의 위치나 크기, 주요 구조물과의 근접정도, 포함된 치아나 악성 낭종으로의 전암 가능성, 환자의 나이나 협조도 등이 고려사 항이 될 수 있다12-13). 전통적으로 연관된 치아가 자발적으로 맹출 할 수 있는 가능성이 있을지라도 임상적으로 치아의 맹 출을 신뢰성 있게 예측하기 힘들기 때문에 많은 임상가들이 치아의 발거를 포함한 완전한 낭종 적출술을 행하여 왔다. 하 지만 이런 완전한 치아의 제거는 연관된 치아가 과잉치나 지 치가 아닌 경우, 치아의 조기소실로 인한 환자의 심리적, 기능 성 문제 등을 가져올 수 있어, 특히 어린 환아들에게서는 치아 의 보존을 위한 노력을 기울여야 한다. 본 증례의 경우 연관된 치아인 제1대구치의 치근이 거의 형성되어 있으며 낭의 크기 가 크지 않고, 중요한 해부학적 구조물이 근처에 존재하지 않 아 낭의 적출술을 시행한 후 교정적 견인을 시행하였다. 매복된 대구치는 대개 치근 형성의 마지막 단계에 발견되 는데, 치근이 형성중이라면 매복된 치아의 맹출 가능성이 높 지만, 매복치의 치근단이 완전히 형성되어 치근단이 폐쇄되었 다면 치아의 맹출을 기대하기 어렵다고 보고하였으나14) 일부 저자들은 치근단이 완성된 후에도 매복치가 맹출력을 가지고 있는 경우도 있다고 보고하고 있다15). 교정적 접근에 대해서 살펴보면 낭종의 팽창으로 인하여 전이된 치아의 견인에 관하 여 azaz 등16)은 형성과정중의 치아를 교정력으로 견인시 치수 강 폐쇄 등 치수조직의 변화, 치근의 형성 저해 등의 여러가지 장애를 유발할 가능성이 있어 관찰하는 것이 좋다고 하였다. Hyomoto 등17)의 경우 치근 완성도가 낮을수록, 조직학적으로 염증세포의 침윤이 심할수록, Fujii 등18)에 의하면 10세 이하, 매복깊이가 5.1mm 이하, 치축이 25도 이하로 기울고, 공간이 충분할 때 자발적 맹출 가능성이 높고 이외의 경우 교정적 견 인 또는 발치 등의 추가적인 접근이 필요하다고 하였다. 본 증례에서는 매복깊이는 얕았으나 40도 정도의 원심경사, 치근 단이 완전 형성된 대구치로 교정적 접근을 통하여 양호한 치 료결과를 얻었다. 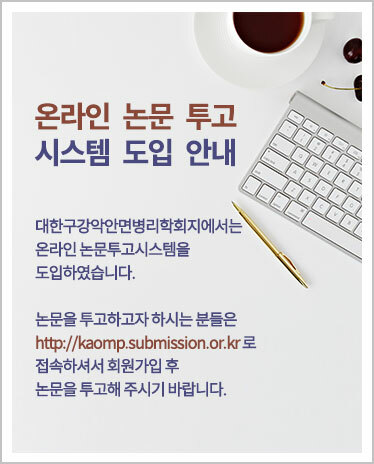 본 증례는 전신질환이나 증후군을 보이지 않은 10대 이전 의 환아의 다발성 함치성 낭이 발견되었고 낭의 제거, 교정적 견인 및 관찰로 양호한 맹출을 보였다. 제1대구치의 함치성 낭은 발생 빈도도 낮고 대개 증상이 없어 발견이 어려우나 진 단 및 치료시기가 늦을수록 그에 따른 합병증의 정도가 심해 지고 맹출유도를 위한 치료가 더 복잡하게 되며 예후 또한 불 량해지므로 정기적인 구강검진을 통하여 조기에 매복에 대한 진단 및 치료가 시행될 수 있도록 하는 것이 중요하다고 할 수 있다. 양측성 또는 다발성 함치성 낭은 다양한 증후군과 함께 발견되는 것이 일반적이나 낭성 병소가 발견된다면 발생 가능한 다른 치성 낭을 배제하기 위한 추가적 검사가 필요하 며, 전신 검사를 통한 철저한 임상 검사는 관련된 증후군이나 전신 질환을 배제하는 데 가장 중요할 것이라 사료된다. Panoramic radiograph showing multiple well-defined unilocular radiolucencies involving right maxillary first molar and both mandibular first molars. Panoramic image from CBCT showing well-defined unilocular radiolucencies containing distal tilted right maxillary first molar and both mandibular first molars. Panoramic photograph showing the eruption and improvement of tilting on the first molars, at 7 months after operation. The cusps of right maxillary first molar and both mandibular first molars were erupted into the mouth at 2 months after operation. A. Modified appliance to eliminate crossbite on right occlusion. B. Clinical views showing crossbite on right first molars. C,D. Clinical views showing good occlusion on first molars, at one year after the operation. NevilleBW , DammDD , AllenCM , BouquotJE : Oral & Maxillofacial Pathology. 2nd ed.Philadelphia: W.B. Saunders. 2001:590-592. ShaferWG , HineMK , LevyBM : A Textbook of Oral Pathology. 4th ed.Saunders. 1993:260-265. TournasAS , TewfixMA , ChauvinPJ , ManonkianJJ : Multiple unilateral maxillary dentigerous cysts in a non-syndromic patient: A case report and review of the literature . International J Ped Otolaryngol Extra.2006;1:100-106. KoKS , DoverDG , JordanRC : Bilateral dentigerous cysts report of an unusual case and review of the literature . J Can Dent Assoc.1999;65:49-51. NorrisL , PiccoliP , PapageorgeMB : Multiple dentigerous cysts of the maxilla and the mandible: report of a case . J Oral Maxillofac Surg.1987;45:694-697. RobertsMW , BartonNW : Occurrence of multiple dentigerous cysts in a patient with the Maroteaux-Lamy Syndrome (mucopolysaccharidosis, type VI) . Oral Surg Oral Med Oral Pathol.1984;58:169-175. TournasAS , TewfikMA , ChauvinPJ , ManoukianJJ : Multiple unilateral maxillary dentigerous cysts in a non-syndromic patient: A case report and review of the literature . Int J Ped Otorhinolaryngol Extra.2006;1:100106. NakajimaT , YokobayashiT , OnishiM : Basal cell nevus syndrome . Int J Oral Surg.1979;8:63-66. De BiaseA , OttolenghiL , PolimeniA , BenvenutoA , LubranoR , MaglioccaFM : Bilateral mandibular cysts associated with cyclosporine use: a case report . Pediatr Nephrol.2001;16:993-995. RalphEM , DavidRA , JeffreyAD : Dentistry for the child and adolescent, 8th ed.The CV Mosby company. 2004:159-160. GroverPS , LortonL : The incidence of unerupted permanent teeth and related clinical cases . Oral Surg Oral Med Oral Pathol.1985;59:420-425. BennA , AltiniM : Dentigerous cysts of inflammatory origin. A clinilcopathologic study . Oral Med Oral Pathol Oral RadiolEndod.1996;81:203-209. LuzA , JoseLG : Dentigerous cyst of mandibular second premolar in a five-year-old girl, related to a non-vital primary molar removed one year earlier: a case report . J Clin Pediatr Dent.1989;22:155-158. PalmaC , CoelhoA , Gonz lezY , CahuanaA : Failure of eruption of first and second permanent molars . J Clin Pediatr Dent.2003;27:239-246. AllingCC , CatoneGA : Management of impacted teeth . J Oral Maxillofac Surg.1993;51:3-6. AzazB , SteimanZ , KoyoumdmiscyKE : The sequelae of surgical exposure of unerupted teeth . J Oral Surg.1980;38:121-127. FujiiR , KawakamiM , HyomotoM , IshidaJ , KiritaT : Panoramic findings for predicting eruption of mandibular premolars associated with dentigerous cyst after marsupialization . J Oral Maxillofac Surg.2008;66:272-276.